Wells Cathedral School is renowned for its music. The new Cedars Hall provides professional-standard facilities for the school and community. These include flexible spaces for rehearsal and recording, a 350-capacity recital hall, and a foyer with a bar. Within the hall, the stage, seating and acoustic wall panels can be adapted for various layouts with differing acoustic qualities suitable for a range of music styles and audience configurations. Exposed structural beams in the roof further enhance the acoustic performance of the space. Central to the scheme is the hall’s double-curved timber roof, formed of CNC-cut LVL ribs spanning in two directions. The range of panels housed within the coffered voids moderate sound as well as forming Cedars Hall’s aesthetically-dramatic centrepiece. One of 49 projects shortlisted across the UK. 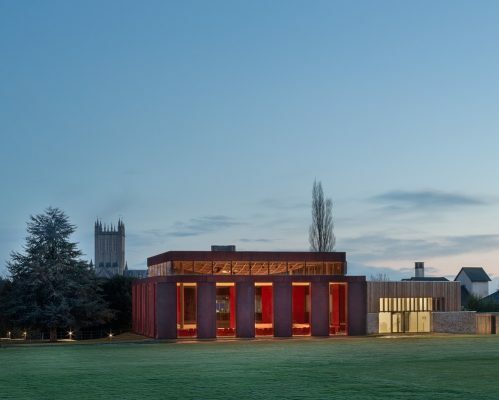 Eric Parry’s Cedars Hall gets planning Eric Parry Architects’ £4.5m new music facility for Wells Cathedral School has been granted planning permission from Mendip District Council. 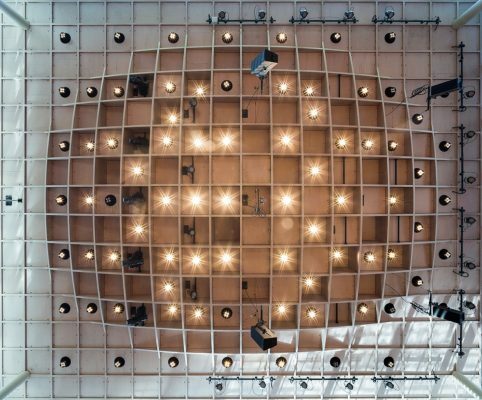 The stunning Cedars Hall provides flexible spaces for rehearsal, performing and recording. 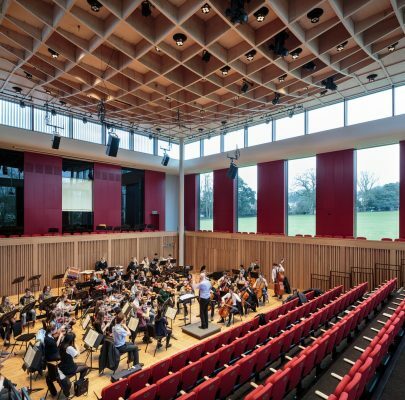 The building includes a recital hall that can accommodate an audience of over 340 people and offers professional quality facilities for the music school and the wider community. 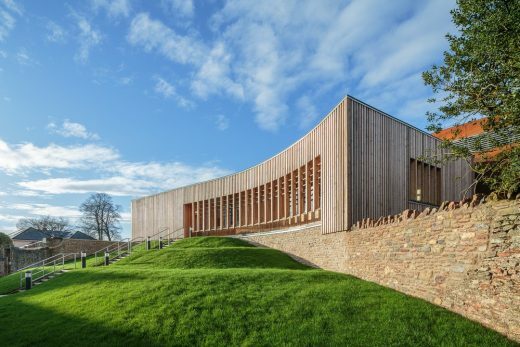 The building is set into the landscape of Cedars Field, the grounds to the Grade 2* listed Cedars House, and responds to the school’s heritage and setting with a considered palette of materials, including weathering steel, timber and clear glazing. The hall’s interior incorporates warm timber paneling, with full height glazing that creates visual connections with the surrounding landscape and allows natural light to fill the interior spaces; in the evenings, the building appears as a lantern on the landscape, uplifting the surrounding exterior areas. Both the stage and seating can be adjusted allowing different configurations for both performances and rehearsals. 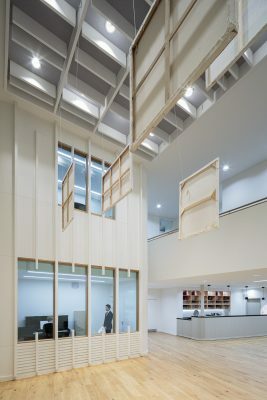 Differing acoustic qualities are achieved with easily adjustable wall panels, and the exposed timber roof structure enhances the acoustic performance of the space. The hall can be used for orchestral music, choir, amplified music, drama, dance and lectures. 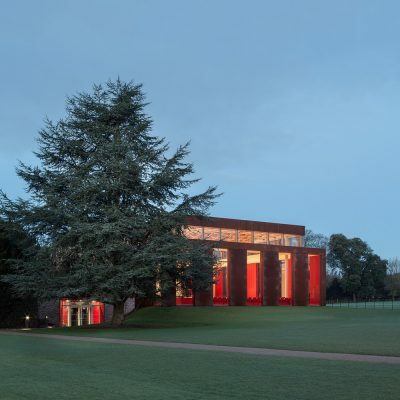 The practice has also designed a new sports pavilion on the site, offering Sport England standard accommodation for two teams and spectators adjacent to the county standard cricket pitch, as well as the restoration of the historic landscape of Cedars Field, which is also formed part of this application. 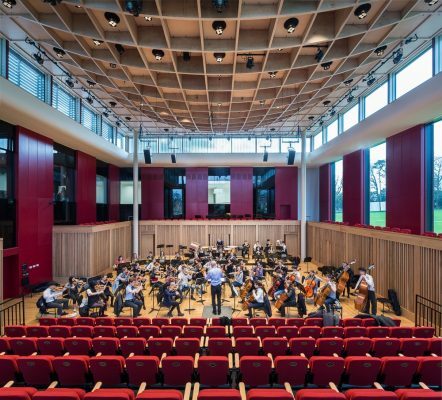 Eric Parry Architects has been appointed by Wells Cathedral School to design a new facility for the teaching, learning and performance of music in the heart of Wells City, Somerset. 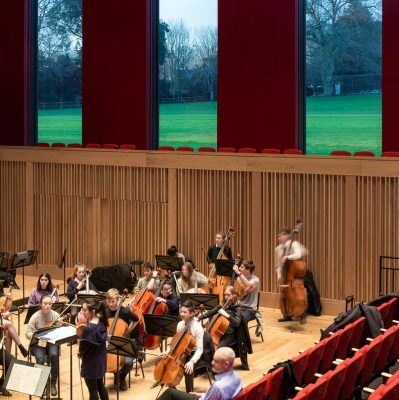 Known as Cedars Hall, the new £3.5million design will contain a technically-excellent recital hall and inter-connected flexible spaces for teaching, rehearsing, performing and recording. The warm timber finished recital hall is recessed into the surrounding garden, which is visible from the hall through large windows. Natural light fills the space during the day and the building becomes a lantern in the landscape during the evenings. The stage, seating and acoustic wall panels within the hall can be adapted for various layouts with differing acoustic qualities suitable for a range of music styles and audience configurations. Exposed structural beams in the roof further enhance the acoustic performance of the space. Sited in The Cedars, the Georgian heart of the school, Cedars Hall lies on the historically significant axis with Wells Cathedral’s Chapter House, and both share the function of gathering spaces for the local and regional community. The new building will maintain important views from the landmark Cedar Tree to Wells Cathedral and stunning views across the garden and grounds. Level access will be provided across the site through the buildings foyer, which follows the existing listed garden wall and also serves as an informal rehearsal and performance space. The design incorporates local stone used on the listed garden wall within the site, low reflective glazing and matte, warm finished steel on the exterior facades. The recital hall interior is finished in timber and can accommodate an audience of over 400. A green roof system is used throughout. The project for Wells Cathedral School builds on Eric Parry Architects’ success with the £6.5 million award-winning Foundress Court at Pembroke College, Cambridge. 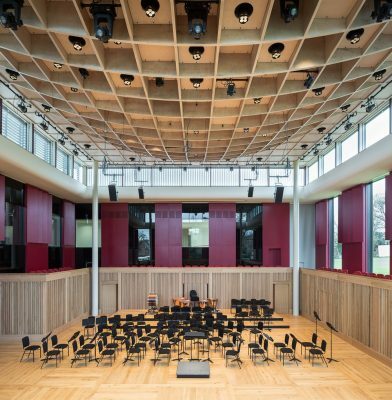 In recent years the practice has also been involved in a number of educational projects including the Bedford School Library, which opened in 2003, New Studio Accommodation at the Wimbledon School of Art, and the new Music School at Bedford School which won an RIBA Award earlier this year.